Today is my Birthday and of course I had to take a mental health day off from work! Lately I have been really inspired to create tree shrines again. This one was a marker or a rite of passage for my birthday/rebirth, as well as an offering to this sacred place called Indian Rock in Berkeley. Over the last couple months I have been walking to the Rock at least three times a week to meditate and heal. Today I thought I would pay homage to this amazing place with some ART. When I arrived to the rock there was three people on it. I was feeling a little timid as I do not like to create my tree shrines in the public view. I love people to discover them, but I hate being watched while I create them.So I decided to walk around the rock and try find a place to create a shrine in solitude. As I was looking around I was fascinated by the little caves that exist at the bottom of the rock. It gave the sense of being at the Temple of the Moon in Peru, which was so mystical and amazing!! I have been to Peru twice and I love it!! The little caves is were I decided to create my internal shrine. At first it was just going to be a rock shrine and then when I was walking around I discovered this Eucalyptus tree seed that was blooming like a mandala. It was fantastic. I placed the seed in the center of my eco-art and it was activated into a tree shrine. As I spent time with there, documenting the shrine I felt very connected to the internal mother Earth. Much like how I felt while I sat within the Temple of the Moon cave at the base of Huayna Picchu. After photo documenting my Eco-Art I decided to take the seed with me and to ascend up the rock, where I began to create another shrine. As I was photography my work, I was startled by this young rock climber. He glided by me and he seemed to just appeared from no where. He sat a short distance away from me in meditation for awhile. The rock is really a destination for a lot of folks. At all times of the day you can find people just hanging out. In groups or many times alone. Then two young girls climbed up the rock. They were really being silly and taking goofy pictures of themselves on the rock. I decided to leave. As I was descending the rock the girls discovered my shrine. And they exclaimed wow this is awesome! wow that is awesome! AWESOME!! and they started taking photo's of it. I smiled within! That is what I want this art to do. To evoke reverence for nature! "happiness is not all, people have a responsibility." 幸福不是一切，人還有責任 translation, A comment left on my Blog from someone in China. "Can you please take our picture with us and Gwen, the old Dog." two old men having coffee with an old dog in the lake merrit area. It is always such a surprise when folks ask me something on the street. Time Pics of Pollen Tree Shrine,five days after with my cat Paulo. So Be It! We all Should Really Love Pollen. Today on my walking meditation to the "rock" and the "rose garden" I had an amazing revelation. Over the past couple months, this walk is were I have been gathering my quotes from strangers in my collecting random interactions series. Today was a little different. As I climbed to the top of the rock, the trees that surround this area really grabbed my attention. It seemed like they were whispering to me. It was a transcendent experience. Today I know that Self acceptance/ Inner value is the ultimate form of ART! What a productive day! Also, today as I walked out my door I was so inspired by the light and the abundance of the beautiful green/yellow tree pollen on the ground. Which most people hate because it causes allergies. What is tree pollen? It is the male cell of a plant needed for fertilization of the female cell and production of new trees. This cell is encapsulated by a very tough membrane to help insure that it will reach its target in tact. It is generally 2 to 100 microns in size making it quite a bit smaller than the head of a pin. Produced in staggering amounts a spoonful can include hundreds if not thousands of grains. Pollen is like the paint,which the artist uses to create a new canvas! It is the elemental in the continuation of life on this planet! I with a sense of fever created this tree shrine in my garden. Crazy I am---reverence to the trees and pollen. I love it! This the documentation makes me really reflect.It almost feels like the tree shrine was a marker of my experience. Which I think all of my art is. This is what I learned Today I know that Self acceptance/ Inner value is the ultimate form of ART! I might forget this tomorrow,but today I knew it! "You lead a charmed life." As I backed up clumsily in CVS pharmacy into a display of wind chimes. Part of my collecting series. "When you get old you cannot become a sissy." Growing old is not for sissy's! It really takes a great deal of courage and acceptance. Today I took my art out of Color Graphics. About ten paintings had been at this lovely corporation for two years and the employees loved them, but nothing was selling. On an energetic level this relationship was really one sided. I do love that I improved the aesthetics in the office, but honestly I have gained nothing from it, except another line on my resume. So today I decided to retrieve and cut the ties. As my car needs repair, the window on the passenger side has been shattered for a year and most recently the engine light is on cannot fix it. I can hardly afford my bills on weekly basis. My monetary life seems to be oppressing my creative one. This is what I need to amend. Hence the Facebook fanpage, which feels weird. Right know it is not helping my psychological agenda because I only eight fans. Pretty dire,but kudos for me doing it. I also thought I had a art rep but that is not really panning out. So I feeling I need to make things happen. Today I put my work on an Internet gallery site "click here" to check out. We shall see what happens. I have turned up the heat! I will search for more opportunities to share my work and to sell my work. I really need to clear my old work out so I can began a new. I really want to sell this work, but eventually I might have to give it away. I do not want to burn it like so many overly dramatic artists have. All I really know is my Art will always be with me and it is the only thing I can ever take with me. It is the gift I can share and that is what I teach. Also at a core level I feel ART is how I will reach my greatest potential as a human being. I am trying to make this happen--- art is life and life is art and I want to radiate my brilliance 2010 is the year!! 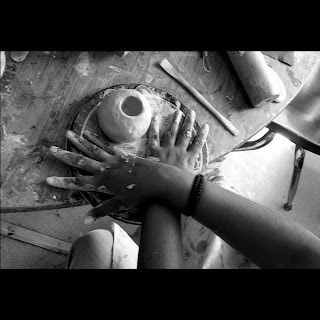 I began this project to create a homage to creativity and to reveal how art has the ability to transcend all boundaries.When I arrived at Lincoln in 2006 the art room was totally vacant and through my vision I pioneered a very successful transformative art program at Lincoln Child Center in Oakland. We have had exhibitions around the Bay Area were our students sell their Art work which is extremely therapeutic. 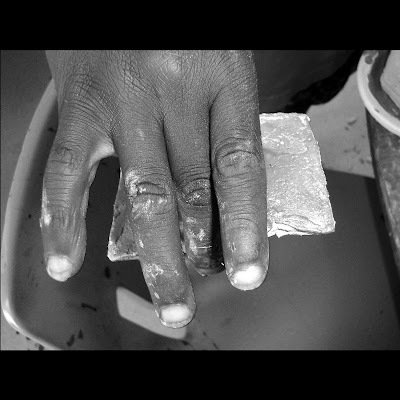 In 2009 the Hearts and Hands project manifested as an awareness community art reach tool for the high risk children that I teach.Many folks do not realize these marginilized children exist.Also, this project was a fundraiser for art supplies, which we desperately always need. This art project was very simple, each 6"x9" card would either have an image of a heart or a hand or both. Using any type of medium. I first started with the children and the front line staff at LCC. Then the word got out and creativity spread around campus and everyone was making hearts and hands. The administrators were loving it. This truly was transformative art process and project. Also, 1000 Hearts and Hands is beautiful demonstration of the essence of collaboration. Folks loved this exhibition and I wanted to share with you a witness's story. Read below--Thank you Melissa for expressing your subjective experience. Walking into Lamyx Tea Bar, I was struck with the calm and soothing atmosphere it provides. My eyes can’t help but be drawn to the array of wonderful colors alongside me as I continue to the counter. This great display of Lincoln Child Center’s Hearts and Hands exhibit. Glancing at each unique piece of artwork covering the wall in what seems to be 1,000 hearts and hands. Each one conveying the individualism of its creator- each piece, each person, each story. It is quite a whimsical presentation, flowing along with all of its vibrancy and expressiveness. Thoughts of happiness, love, loss, and hope consume me into the stories behind each and every one. Among flowers, brightness, darkness, brokenness, and mystery, I see an overall connectedness. It is as if these are all driven by the same passion to convey this masterwork’s message as a whole, reaching out to its viewers. As I drink my green tea while listening to the play list consisting of worldly allure, I can see all of these hearts and hands come together with all of their diversity and almost suggesting to me that all it takes is anyone’s loving hearts and hands to make a difference in a child’s life. Each one of the hearts that are up remind me of the soul and emotion that went into this presentation, while each hand I see reminds me of the very real people who created it. Each with their own views, hopes, and dreams. In essence, Lincoln Child Center is lending not only its hands but also its hearts to reach out and embrace those other hearts and hands within the community. The barren spaces on the wall reflect those who have taken notice of the love and common theme of peace. Contributing themselves to the cause taking a piece of art into their home and into their hearts and hands, offering endurance for a brighter day. The artwork provides a very strong declaration, as the children and staff of Lincoln Child Center imply in this masterpiece. They are the kids you do not see or hear, but they refuse to remain in the shadows. The cause is very real and every vulnerable child is worthy of basking in the same light as others. Lincoln Child Center is offering its hearts and hands to you, in hopes for you to do the same. "Ms Lisa you are the best art teacher ever. Today I had such a great day hanging with you. I had a great day, not like yesterday." Then I told him about this project and he started saying random word.
" I am so deep under water, I need a scuba suit to get through the front door." "Lisa, I really seen a transformation of your relationship to anxiety. It seems like you have turned up the heat alchemically speaking." This project will end in seven months at that time I most likely will be making a big move to LA and I need to have my practice of acceptance of myself in place. This goal is not about the place,but about the opportunity of change in a physical, mental, and psychological way. Tulum Mexico is a Pre-Columbian walled city located on the Caribbean coast in Quintana Roo, Mexico.This is such a mystical and amazing place! It is paradise. We stayed at "Cabana Copal" in a quaint grass hut with a sand floor, literally steps away from the ocean. Outside our magical hut on the beach where we had nightly visits by an Iguana, that is were I created my tree Shrine. While creating this tree shrine my creative process seemed kind of fragile from my near arrest in Point Reyes, National Park,CA from creating the same art. From this state of being I choose the safe palm trees outside our hut to revere. For me the experience was kind of flat and filled with fear of being caught. I let the fear of being caught run the gamete. I actually destroyed the shrine quickly and made one from leaves and stones. But in reflection on an internal and metaphysical level I had an amazing experience. This is a powerful and sacred place and I look forward to going back very soon and creating some amazing reverent art in paradise! It looks like I have all my ducks are in order, but something is missing. What is it? It looks like a lot on paper, but I still feel that something is missing. I hate to say it but it is monetary. I am sick of struggling and I want to make a living off being an artist. It seems things have not taken off as fast as I have wanted. How does one take the next step or how does one do it? I feel I need more order and then it will all happen. I think it is time to make a list. I have a zillion journals with lists and more lists, I thought it might be more powerful to put into virtual reality and see what happens. This list is just beginning, but I think the trick is consistency. Talk about order in chaos! My other half-what is she thinking? I am in amazing collaboration called "Art is Moving" with artist Lauren Odell Usher. We began our collaboration in 2008 and have had some great success. Every time we meet we think of more exciting things to create.We had a project for a year were we opened, curated, and ran a gallery with others in Oakland, called the Red Door Gallery and Collective. In that experience with a large group of people we found out how collaboration can be really dysfunctional. We also manifested the ARTcart, a community art reach project and we have our Blog. We have many different and powerful projects going at once. We both are obsessed with Art and we share the same core philosophy on ART'S function, which is service and empowerment. Collaboration can be really hard and we have found a balance to make it work. It really is easy and fun! And I feel we are making a difference in the world of Art. The interesting thing is our own art is so different. It seems we come at things from totally different directions and meet at the same point in the middle. Like, Lauren's latest project she has made a call out for pictures of peoples living rooms. I am participating in this project the pics here are two images of my living room. I have no idea were she is going with this and I look forward to see what transpires. "Click Here to check out Lauren's latest project. Participate if interested! It is interesting one of my professors in graduate school advised me not to air my dirty laundry in the conceptual explanation of my art. She stated it gets to messy and many folks might think you are trying to sensationalize it. After much reflection I think it is time. This creative series is my first in terms of conceptual art and it might become messy or not. Collecting Random Interactions with the other Series sourced from a couple things. The first being my desire to heal my severe social phobia. Most people have experienced some level of discomfort in social situations. It becomes a problem when the phobia makes you evade situations or experience panic attacks within these situations. At times it is a form of self imposed torture. I have been seriously working on healing for the past five years and it is time to let this old and very powerful friend go. The second as I flip the coin, social phobia is really a disconnect with people. Through this project I seek to connect with people and to acknowledge their brilliance. We will see how this goes. This is evolving and I am excited. walking to the rock. A car full of teens passed. The very cute one in front said "Lovely day" in a fake British accent as he tipped his hipster hat off to me with a smile in his eyes. aww.... put'n that one in my pocket for a rainy day. "The first step after lunch is always the hardest"
Hot young man playing basketball with out a shirt on.I became a twelve year old. Meekly saying hi back. Ever since I was a child art has been been my magic. I quickly found through drawing that I could create parallel universes of extraordinary imagination. As I mature as an artist I still believe art is about magic. In my site specific installations and my painting I transverse into a voodoo priestess,a neolithic cave painter, or shamanika. This work I took after it was in my show Caol 'Ait (thin places). The show was well received as my audience perceptions were altered by a multi sensory experience. After being in show for a month, this piece was in my studio. One day as I entered my studio there was this amazing light that was streaming through the window, merging and dissolving into my mixed media lotus piece. Magic it is! Thats what art is the merging and the dissolving of the artist and their audience, through the vehicle of their pyschic and physical imprint called Art. Luckily, i had my camera to witness it all. That ties into what i think photography is, it is the Witness that stands within the artist. Response to Art is Magic! Only if the social fabric and the unsure strings be broken or redefined, I'd be much more of myself. I'm a 23 yr old bachelor graduated (engineering) from the premier institute of India. I'm earning now and I am thoughtful. I am a believer, a traveller who believes in a purposeful living. And thus, extraordinarily attracted, in a dress of desperation, to anything which seems to associate itself with Truth. Though the inner waves have not yet manifested to my exterior domain to the extent I would have liked, a certain chain of events are accelerating its burst. I pioneered the Transformational Art Program at Lincoln Child Center in 2006. This project is called the Hands of Creation. In this project I am honoring the child's creative abilities. I can only take portraits of my students hands because for protection of the child's identity. The children call the art room-the calm room. It is really a magical place were amazing things transpire. Created my first "Tree Shrine" of 2010.We had a nice trek to Tennessee Valley Cove, which is so beautiful. The views are extraordinary. We could not get onto the beach because a river had made its way to the ocean, blocking any bridges out to the beach. I created the shrine around a rock and drift wood. The tree that had been submerged into the sea transforms into something ethereal. I felt really mindful and connected to the universe while creating this Eco Art.I woke up the next feeling balanced. I like this feeling!